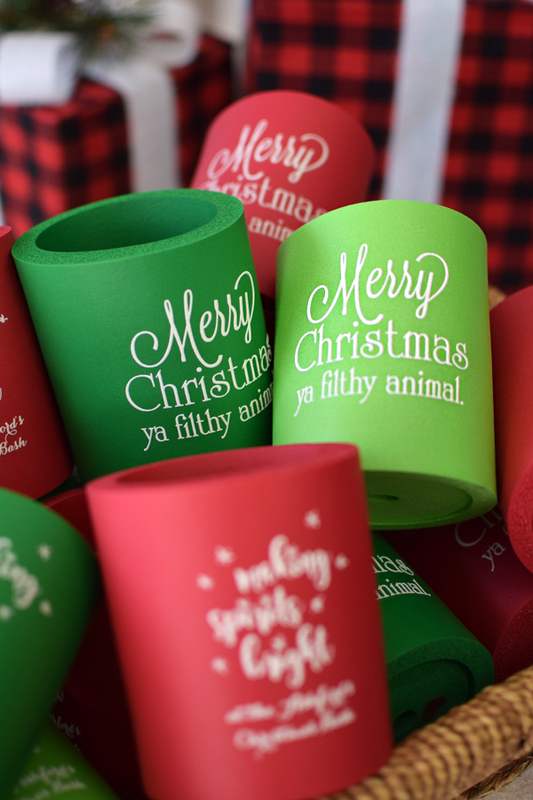 Keep your cans colder longer with custom printed 3/8 thick foam Christmas party can koozies. These koozies have a vintage, retro feel and are a party favor your guests will love. Personalized beer can koozies are custom printed with a festive Christmas design and your own custom message. Each 12 oz koozie is made of 3/8 inch thick soft insulating foam with a rigid construction and provide exceptional insulation for any 12 ounce can of beer or soda. Choose from 18 foam colors to match your party theme. Two-sided printing available at not extra cost. To order multiple koozie colors, simply enter your request in the special instructions box below (We require a minimum of 25 koozies per color request).